Malcolm is different, he likes his beans under his toast and he thinks a lot. He worries about how to answer questions; worksheets at school with only one answer perplex him. 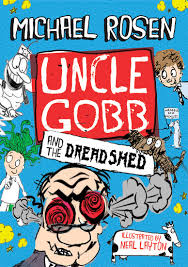 At home his Uncle Gobb is getting increasingly frustrated with Malcolm’s inability or refusal to answer simple general knowledge questions and threatens to put him in the ominous DREAD SHED if he doesn’t buck his ideas up. This is an amusing read with lots of commentary from the narrator. Children will enjoy the playful approach to language and delight in words which are savoured and invented ‘upsengry’ and ‘confuzle’. There is intrigue in this story, a sprinkling of magic when two genies appear, plenty of humour and the occasional social comment too. The DREAD SHED, for example, was for the ‘bad poor’ not the ‘bad rich’. Adults and children will find plenty to talk about and enjoy and the illustrations and varied format add to the book’s appeal. Read the story to your child pausing to talk about aspects of the story or illustration when your child wants to. Some parts you might like to read together eg the conversation between Malcolm and his friend Crackersnacker in chapter 11 and the conversation between Malcolm and his uncle in chapter 17. Which bits did you find funniest? Go back and read them again together. Collect words that rhyme like measles/easels or words that mean the same thing eg abolished. Stick up a big piece of paper and think up some really hard questions where you don’t know the answer and make a list. You could add some ‘killer’ answers too. Make an annotated drawing of a DREAD SHED what might be in it?